I challenged myself to create a piece of abstract art. 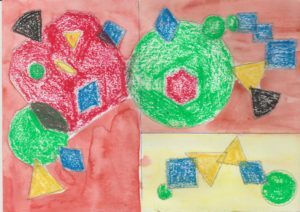 I used the wrong medium, which was oil pastel, for coloring my geometrical shapes. My coloring was bad and the pressure showed. The background was in poster color. Although this is an abstract, I wanted to make a face so I drew some geometrical shapes inside the big squarish one. It seemed like I drew a body and legs, but I assure you, I didn’t plan that consciously. It seems I have an in-built tendency to draw a figure. That shape must be inside my unconscious mind, which directed my hand to draw those shapes at THOSE positions on paper.